Donated by Eleanor Houston Smith in June 1984 (accession 1987:33). Organized in six series: I. General Real Estate Files, 1834-1964; II. Title Papers Relating to Coded Properties, 1768-1953; III. Records Relating to Uncoded Properties, 1867-1961; IV. Maps and Architectural Drawings, 1882-1967; V. Real Estate Holdings of Sallie Sherrerd Houston, 1902-1942; VI. Real Estate Holdings of Samuel Frederick Houston, 1834-1952; VII. Reference and Research, 1971-1989. All series are arranged alphabetically. Henry Howard Houston was born in 1820 in Wrightsville, Pennsylvania, son of Samuel Nelson Houston and Susan Strickler. He left school at fourteen began his working life in the mercantile industry. In 1840 he was employed at an iron forge owned by James Buchanan (later U.S. President), the Lucinda Furnace in Clarion County, Pennsylvania. Having traveled for a few years, Houston learned to appreciate the value in the transportation industries; he began working for a canal and railway transportation company in 1847 in Philadelphia. By 1850 he had joined with the Pennsylvania Railroad as an agent in their freight department. He quickly rose in the ranks to become general freight agent for the entire railroad in 1852. Houston worked hard to expand and improve the operations of the railroad and succeeded in bringing it large profits during the massive movement of people and materials during the Civil War when the vice-president of the railroad, Thomas A. Scott, became Assistant Secretary of War. During these same years, his own fortune ascended to those of the very prosperous. Houston left the Pennsylvania Railroad in 1867 to start a number of transportation companies. Almost all of these companies, however, had direct, and often favorable, business connections the Pennsylvania Railroad. Among the most notable companies were the Union Freight Line (later absorbed by the Empire Transportation Company) and the International Navigation Company, which created the Red Star Line. In addition to these companies, Houston invested in large number of railroads and related industries, such as iron and steel works, during this period. 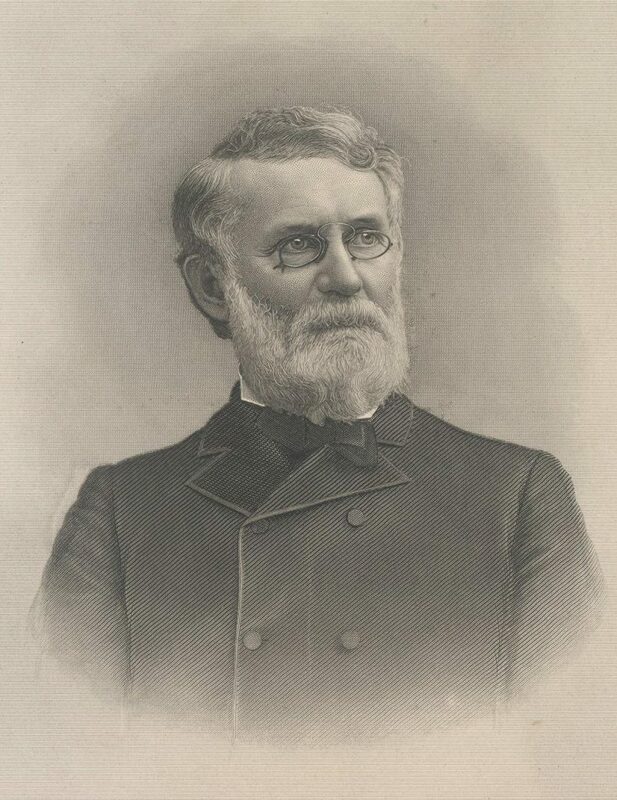 His close association with the Pennsylvania Railroad eventually earned him a position on its board of directors in 1881, a post which he held until his death. Houston’s financial interests were not limited to railroads. He also invested in California and Nevada gold mines and, more significantly for his estate and heirs, the fledging petroleum industry. Houston lived most of his adult life on Tulpehocken Street in the Germantown section of Philadelphia. In 1886, at the age of 66, he built a mansion “Drum Moir” in the adjacent Philadelphia community of Chestnut Hill. His interests in this area of the city were turned into an investment opportunity when the Pennsylvania Railroad decided to build a commuter line from center city Philadelphia to Chestnut Hill in the early 1880s. The subsidiary corporation – the Philadelphia, Germantown and Chestnut Hill Railroad – which formed to complete this work was headed by Houston. For some years prior to this, he had been purchasing land in the western parts of Chestnut Hill and Mount Airy and some small tracts in Germantown. By the time the Chestnut Hill railroad was completed and operational, Houston was the largest single landowner in this section of the city. He immediately began to develop his holdings by opening streets, building a resort hotel (now the campus of Chestnut Hill Academy), a country club, an Episcopal church, and several dozen rental houses. Houston’s real estate investment and development plans were not limited to these communities. He also acquired large holdings in the upper section of Roxborough and adjacent Springfield and Whitemarsh Townships in Montgomery County. These areas were going to be located at the end of another branch of the Pennsylvania Railroad which was never built. Henry Howard Houston died in June 1895 and was survived by his wife Salle Sherrerd (Bonnell), and three children, Sallie Bonnell Houston Henry, Samuel Frederic Houston, and Gertrude Houston Woodward. After Houston’s death, the management of his real estate empire was turned over to the executors of his will. His son, Samuel Frederic Houston, and friend, Edgar Dudley Faries, were the main agents. They continued to rent houses in Chestnut Hill and Germantown into the 1930s and 1940s. Between 1895 and about 1925, the estate also sold off the choicest lots in Chestnut Hill to wealthy Philadelphians, who built new homes on them. These sales helped to create and maintain the status of Chestnut Hill as a leading neighborhood for the Philadelphia elite at the beginning of the twentieth century. In addition to the Chestnut Hill activities, Samuel Frederic Houston was very interesting in developing the estate’s holdings in Philadelphia’s upper Roxborough and adjacent Montgomery County. The estate actively worked to acquire land in upper Roxborough and Springfield Township to fill out its existing holdings. Samuel’s original plans were to make this area an extension of the Chestnut Hill by building a bridge over the Wissahickon gorge, which divided the two communities, and by constructing a road which would connect Roxborough with the Main Line and Chestnut Hill. This idea first appeared in public 1910. In the 1920s the estate hired Philadelphia architect and University of Pennsylvania professor, Paul Philippe Cret, to prepare a traffic study on the best route for the new road. At the same time, Samuel tried unsuccessfully to interest the City to hold its Sesquicentennial fair on the estate’s Roxborough land. In 1927, however, he did succeed in persuading the Episcopal Diocese of Pennsylvania to accept a tract of land for the site of new grand cathedral. In spite of Samuel’s donation of the mortuary chapel, the Diocese was unable to raise enough funds and interest in the building to complete more than the choir and chapel. When Samuel was unsuccessful in getting the necessary support of both the Philadelphia and Montgomery County officials for a development plan based upon on a cross-county road, he scaled back the design to include only a bridge between Chestnut Hill and Roxborough. He hired Robert Rodes McGoodwin in the 1930s to design several modest middle class houses which were to set the tone of the development in Roxborough. Just after World War II, Houston hired the firm of Saarinen, Saarinen, and Associates to put together a full scale development plan for the area. Saarinen’s city planners produced a brochure detailing recommended mixed use development and a bridge over the Wissahickon. Houston tried to interest a number of institutions to locate at this site, the most notable being the United Nations, Temple University, and the Veteran’s Administration Hospital. These plans became too ambitious for Samuel to undertake as he reached his 80s and in the end he chose to follow a very modest design for typical post World War II ranch-style housing development surrounding a shopping center. This new community, which was largely the design work of Walter K. Durham, is known today as Andorra. The death of Samuel Frederic Houston in 1952 ended the active real estate development of the Henry Howard Houston estate. The estate continued its legal existence until the death in 1961 of Henry Howard’s last surviving child, Gertrude Houston Woodward. Upon her death the assets of the estate were divided among the surviving heirs. Most of the unsold land fell to Samuel Frederic’s daughter, Eleanor Houston Smith, who took an active role in preserving much of the land for open space. The Henry Howard Houston Estate Papers document the creation and development of a large real estate investment in late nineteenth and early twentieth century Philadelphia and Montgomery Counties. The collection also provides extension information on land ownership in this area from the late eighteenth to mid nineteenth century through the original deeds, which form the title papers series of the collection. The General Real Estate Files series contains correspondence and working files relating to real estate management and development for the Henry Howard Houston Estate primarily from 1920 to 1950. The series includes correspondence, proposals and a few architects’ plans for the development of the Estate’s land holdings in the Germantown, Chestnut Hill and Roxborough sections of Philadelphia County and in Springfield and Whitemarsh townships of adjoining Montgomery County. The Eliel and Eero Saarinen correspondence is the most extensive. The series also includes financial and personnel records, title papers to properties purchased by the Estate’s Joint Account (arranged by grantor), property appraisals, an analysis of property improvements and tax lists. Most notable among these records are a comprehensive ledger of rents and repairs (1884-1901); a printed copy of the will of H.H. Houston (1895); a printed copy of the executor’s accounting of the estate for the period 1895-1901; comprehensive appraisals of the Estate’s real estate holdings as of 1913 and 1940 and an “improvement analysis” for the period 1913-1940; and, a circa 1950 promotional brochure by Saarinen, Saarinen and Associates of the Estate’s proposed development plans. The Coded Property series is the heart of the Houston Estate Papers. Houston’s extensive accumulation of Philadelphia real estate is documented purchase by purchase; taken as a group, these property files track Houston’s decision making over a thirty year period. Many files contain the original parchment deeds to a given property, in many cases extending back as far as the eighteenth century; this should be of considerable interest to local historians. The bulk of the materials, however, reflect Houston’s own activity and date from 1865 through 1895. Deeds, mortgages, correspondence, tax receipts, title searches, briefs of title, maps and property plans; registers of grantors and properties can be found in this series. Summary accounts of all properties are found in the two volume “Deed Record Book.” Individual files are arranged by an alphanumeric coding system keyed to an index map prepared by the Estate in 1906. The index map includes all Mount Airy, Chestnut Hill and Roxborough properties owned by the estate in 1906. Copies of the index map, reduced and mounted on ten separate boards, are contained in this series. The index map does not include properties sold before 1906, acquired after 1906 and/or located in areas other than the three described above. A register, along with a grantor index, listing all the coded properties is located at the beginning of the series. The coded property series also includes approximately 120 individual property plans found in their respective property folders. The Records Relating to Uncoded Properties series contains documentation relating to properties which do not fall within the coding system established by the managers of Henry Howard Houston’s real estate holdings. These records are arranged in three subseries: properties west of the Wissahickon Creek, most of which are located in the Andorra section of upper Roxborough; properties east of the Wissahickon, including Germantown, Mt. Airy and Chestnut Hill; and properties outside of Philadelphia. The documents include deeds and other title papers, tax bills and assessments for municipal improvements, a brief renter index for the Andorra development and a few property development plans. The Maps and Architectural Drawings series consists of maps, site surveys, plans and architectural drawings arranged according to a geographic-numeric index map used by the estate for Philadelphia county properties. The index designates fifteen geographic areas in Philadelphia and Montgomery counties and one miscellaneous category. All maps and drawings in the Houston Estate Papers collection correspond to a location in this index. The detailed map inventory can be found here: https://archives.upenn.edu/digitized-resources/docs-pubs/houston-maps-inventory. The maps, architectural drawings and related textual materials generally reflect twentieth century development of Houston properties in the Germantown, Mount Airy, Chestnut Hill and Roxborough sections of Philadelphia. This series complements and often is directly related the documentation found in the first three series. The Real Estate Holdings of Sallie Sherrerd (Bonnell) Houston series and the Real Estate Holdings of Samuel Frederic Houston series document the purchase, management, and development of properties which were acquired to fill out the estate’s holdings in the Roxborough section of Philadelphia County and across the county line into Springfield and Whitemarsh townships of Montgomery County. The contents are primarily title papers and real estate tax and assessment receipts. Tax and assessment receipts are arranged chronologically and the title papers are arranged by last name of grantor. The Research Materials series contains research and reports relating to the Houston estate and family. Its contents are papers and copies of published and manuscript works created by those who have studied the Houston family and the Estate of Henry Howard Houston at various times in the mid and late twentieth century. It includes the notes of those who had access to the collection and sought to organize it prior to its gift to the University of Pennsylvania Archives. In addition to this is a copy of the inventory of the Henry Howard Houston Estate collection at the Pennsylvania State Archives. Copies of research on the life of Henry Howard Houston and on the extended Houston family and on the Houston family development of Chestnut Hill can be found here. These materials are assembled here for the convenience of the user of the collection. Researchers should note that most of the financial and investment records of the estate from around 1910 to the 1950s are found in the Henry Howard Houston Estate Papers, Manuscript Group 154 at the Pennsylvania State Archives. Houston’s personal papers are located at the American Philosophical Society and a small collection of architectural drawings at the Architectural Archives of the University of Pennsylvania. 8. Real Estate Title Insurance and Trust Co.
(3), 1227 N. Myrtlewood St.
(4), Chew and Lawrence Sts. Other Philadelphia properties: W; Drexel Hill, Pa.
Bills, 2.F.12 – M.3, B.12. C. Pennsylvania Historical and Museum Commission, Inventory of Henry H. Houston Estate Papers. 1. Chestnut Hill Almanac, Chestnut Hill Street Names. 2. Construction dates and location guide for Houston houses, Chestnut Hill.